Meditation at Wat Yai Chaimongkol. 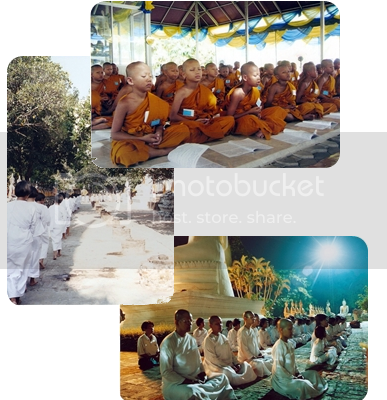 Wat Yai Chaimongkol, an ancient school of meditation in Thailand , is rich in its tradition of meditation teachings. It is situated 70 kms north of Bangkok, has a retreat environment and far from the stresses of modern city life. Wat Yai Chaimongkok offers not only a quiet world of meditation to discover the nature of mind but also methods to purify it. It is the meditation that slowly frees us from all pains, fears and immeasurable sorrows. All the spiritual learning (Pariyat Sattadham) and practicing (Patibhat Sattadham) in meditation are aimed at that one single point: to putting an end to suffering (Pattiwet Sattadham). With the right teaching and training, Wat Yai Chaimongkol presents simple but powerful meditation practices from the heart of the Ayutthaya tradition. Since the meditation is universal and cuts through political and religious barriers, therefore, anyone, whatever their religion or background, can practice. 2) The practice of Insight (Vipassana Khammathan) to arise with wise wisdom in reaching the goal of human existence, enlightenment. For the beginners, the method is very simple, just to rest your attention on the breath by breathing in and out and uttering “Bhuddho” from moment to moment. A beginner should practice in short sessions to follow thoughts that arise in their heart of hearts. As the practice of meditation continues, one may experience stress relief and further spiritual development such as states of bliss, clarity, the absence of thought, and eventually the lasting happiness. During the spiritual practice, the spiritual practitioners must be mindful of whatever they do, and must not lose their presence. Be at ease, be as natural and open minded as possible. We warmly welcome and invite all to attend the meditation sessions of Wat Yai Chaimongkol including recitations, Dharma teaching and talks, etc as presented in the tables on the right. Please note that the schedule of activities is intended as a general guide only. For up-to-date information, please visit our contact page. "Release all grasping to rest in great peace and relax our greed to arise the realization. (Ploy Laew Wang Wang Laew Baow)"
Phra Maha Nuttanit Sumano, 2001. 1. Almsgiving and Dharma Preaching begin at 8 a.m. during the Buddhist Rain Retreat (July – October). 2. The meditation practice is free of charge. 3. On-site overnight accommodation is available. Reservations may usually be made up to 3 days in advance or 15 days in advance during Buddhist ceremonies/rituals. 4. Dress is casual and comfortable. White color and polite style is highly recommended. In 2005, Wat Yai Chaimongkol was appointed, by the Maha Thera Samagom Council (According to its Order Number 29/2005), to be a Provincial Centre of Meditation Practice of Ayutthaya Province. 1. Concentration Meditation Retreat at Wat Yai Chaimongkol - the secret of all education successes of the new generation. 2. Walking meditation that energized by the warm Oriental sun and the Great Pagoda's spirit. 3. Full moon meditation: the meeting of the mind and the moon.